ANAHEIM -- The Angels went into their game against the Baltimore Orioles leading the majors in hitting, but when they walked off the field Tuesday night they had to wonder what hit them. 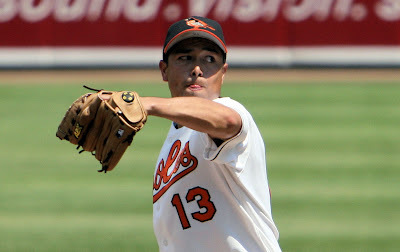 Lopez (7-3) and three relievers combined to shut out the Angels on four hits in the Orioles' 3-0 win before 18,521 at Edison Field. It was the fourth time the Angels have been shut out this season and the first time since May 7. Lopez, a 26-year-old rookie from Mexico, gave up all four Angels hits and survived five walks in seven innings. Buddy Groom, Willis Roberts and Jorge Julio (17th save) combined to finish it off. Because Seattle also lost Tuesday, the Angels remain four games back in the American League West. The Orioles' combined pitching effort spoiled the outing of Angels starter Ramon Ortiz, who pitched like he has all season. Ortiz gave up two runs and five hits in eight innings, but was tagged with his first loss since May 24. It was the sixth time in 16 starts this season Ortiz has gone at least eight innings. Angels pitcher Scott Schoeneweis, in his first appearance since being demoted to the bullpen, gave up a home run on his first pitch to Jay Gibbons and a double to Geronimo Gil in two-thirds of an inning. If it's any consolation to Schoeneweis, Gibbons also homered off Ortiz. Thought the Angels did not score, they had chances. Twice they had a runner on third with less than two outs and failed to score. They were hitting .303 with runners in scoring position going into the game, but went 0 for 9 on Tuesday and stranded six baserunners in scoring position. The Angels particularly had chances against Lopez in the early innings. In the second inning, they had runners of first and second after walks by Troy Glaus and Scott Spiezio with one out, but came up empty. Adam Kennedy and David Eckstein began the third inning with singles and after Darin Erstad forced Eckstein at second, the Angels had runners on first and third with one out. However, Tim Salmon lined out to shortstop and Garret Anderson lined to first and quickly, the inning was over. In the fourth, walks by Glaus and Spiezio set up another potential rally. Orlando Palmeiro tried to bunt the runners over, but popped out to the catcher Gil behind the plate. But when Gil slipped on the synthetic warning track in front of the backstop, the runners advanced to second and third. Bengie Molina followed with a line drive to right, causing Glaus to break towards the plate. But the ball stayed in the air long enough for right fielder Gary Matthews to catch, and Glaus had to retreat to third, missing a chance to tag and score. The Orioles got on the scoreboard in the fourth inning on Gibbons' two-out solo home run. It was the major league-leading 25th homer Ortiz has allowed this season, but 20 of them have been solo homers. The Orioles got a gift run in the seventh after an apparent miscommunication between the right fielder Palmeiro the second baseman Kennedy. Marty Cordova began the inning with a popup to shallow right. Kennedy ran with his back to the plate but Palmeiro appeared to call for the ball. Kennedy then veered off by Palmeiro didn't get there in time and the ball fell in for a single. Chris Singleton followed with a single to move Cordova to third. Even though the next batter Gil hit into a double play, Cordova scored to give the Orioles a 2-0 lead. ANAHEIM -- Angels manager Mike Scioscia had said he expected his club to be ``well represented'' at next week's All-Star game, and he was correct. It's just that he didn't figure that two of the three Angels going would be himself and trainer Ned Bergert. Left fielder Garret Anderson was named as a reserve by American League manager Joe Torre, the only Angel player to make the team. Center fielder Darin Erstad was one of five players selected by Torre to be in the running for the final spot. In the Internet voting conducted at MLB.com and ESPN.com, Erstad finished fifth with 122,458 votes. Boston outfielder Johnny Damon finished first with 692,989 votes. Scioscia admitted that he figured more than one of his players would go, naming catcher Bengie Molina, closer Troy Percival and pitchers Ramon Ortiz and Jarrod Washburn as candidates. There still is an outside chance that another Angel will go because Red Sox pitcher Pedro Martinez has declined his invitation. Both Ortiz and Washburn are candidates, though Ortiz pitches Sunday and Torre has said he'd be less inclined to take any pitcher that pitches Sunday, only two days before the All-Star game. When Shawn Wooten returns from a rehab assignment after the All-Star break, Scioscia will have the right-handed bat the club has missed all season. But he might also have trouble getting enough at-bats for those who have filled his role so far. Against left-handed pitchers, Benji Gil his hitting .394, Jose Nieves is hitting .356 and Scott Spiezio is hitting .371. ``It's a nice problem to have,'' Scioscia said. ``Shawn just adds depth to that whole package. It's not going to be any dilemma because as a team it'll make us stronger. Scioscia pointed out the importance of being able to hit left-handers, because in the A.L. West the Angels go up against lefties like Barry Zito and Mark Mulder in Oakland, Jamie Moyer in Seattle and Kenny Rogers in Texas. ``What we need to do against the good left-handers is send up right-handed bats that match up well,'' Scioscia said. Pitcher Scott Schoeneweis began the night Tuesday not having pitched in a week, having been replaced in the starting rotation by John Lackey. Schoeneweis has pitched in the bullpen before, but it was three seasons ago. ``We want him to get a feel for the warm-up process and the mental preparation,'' Scioscia said. In 1999, Schoeneweis went 1-1 with a 5.49 ERA in 31 relief appearances.